Bing Crosby is perhaps little known to anyone born after 1970, but for 50 years he was an enormous star on records, radio, and film. Throughout his career he appeared with and befriended great musicians, including Eddie Lang, Joe Venuti, Louis Armstrong, Jack Teagarden, and Les Paul. He was also admired by other singers. Frank Sinatra told journalist Pete Hamill, "Everybody wanted to be Bing Crosby, including me." Although Crosby is sometimes thought of as a pop crooner, jazz critic Ralph Gleason wrote that he was "the personification of the whole jazz movement -- the relaxed, casual, natural, uninhibited approach to art." The jacket of Gary Giddens's Crosby biography quotes clarinetist Artie Shaw on the singer: "The thing you have to understand about Bing Crosby is that he was the first hip white person born in the United States." Crosby was an innovator in many other ways. He was an early advocate of magnetic tape as a recording medium and gave one of the first reel-to-reel tape recorders to his friend, Les Paul, who soon modified it for multitrack recording. Crosby began pre-recording and editing his radio programs so that he could control their quality and ensure that they could be rebroadcast and archived. 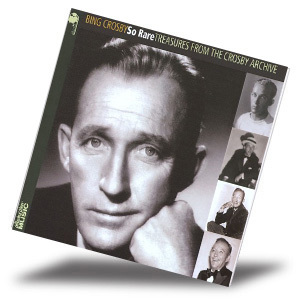 Collectors' Choice Music and Bing Crosby Enterprises have released six Crosby CDs, all of them available for the first time on CD and three never previously available in any format. Crosby maintained an extensive collection of his own recordings, whether he did them for record companies or for radio. He often traded tapes with other collectors and, according to the liner notes for one of the Collector's Choice sets, So Rare: Treasures from the Crosby Archive (CCM2109), he kept files detailing his recordings. 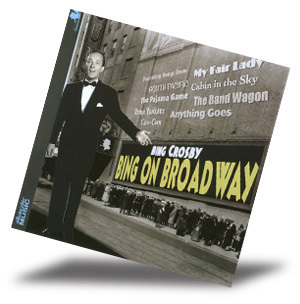 Two of the new CD releases, So Rare and Bing on Broadway (CCM2107) are largely culled from the Crosby estate's archive of the singer's radio performances. So Rare begins with two songs from a 1931 radio appearance Crosby did for CBS soon after he left Paul Whiteman's orchestra. The sound on "Just One More Chance" and "I'm Through with Love" is unusually good considering the age of the recordings, and Crosby was well on his way to finding his voice. His accompanists include Joe Venuti, Eddie Lang, and Bunny Berigan. Two years later, in a promotional appearance for Spanish Paramount Pictures, Crosby was already losing some of the sweet crooning sound of the 1930s and sounding more like the jazz-influenced pop singer he would become. By 1941, when he sang "Over the Rainbow" and "As Time Goes By" for the Kraft Music Hall radio show, he was stretching out notes and playing with the rhythm of the song, even as the band bathed him in strings. Crosby's singing seemed almost effortless at times, but he was as rhythmically adventurous as Louis Armstrong or Sinatra. The first disc of So Rare continues through the 1940s and to the late '50s, offering a surprise 1955 cover of Johnny Ace's "Pledging My Love," which Bing performed on his radio show. Bing precedes the tune with a short dissertation on rock'n'roll, and he�s ambivalent, though not at all bitter, about the music. You wouldn't take Crosby for a rock and roller, but he sounds surprisingly comfortable with the song. The second disc continues through to 1976, opening with a 1957 performance of "So Rare" that shows off Bing's jazz chops with a small group. Five Jimmy Van Huesen tunes follow, and Crosby's interpretative skills on those great songs demonstrate his mastery of American songwriting. Both discs show the singer's ease with novelty tunes, great pop tunes, and show tunes. The six tracks Bing recorded in 1966 and 1967 for Reprise, the label Sinatra established, don't quite get off the ground, and two tracks from 1970 attempt to update him, with mixed results. But overall, So Rare: Treasures from the Crosby Archive is a solid overview of the singer's career. Because of the different sources and dates of the recordings, their quality varies, though nothing on the disc sounds bad. Bing On Broadway is composed of recordings from Crosby's CBS radio show in the mid-1950s. Bing is accompanied on all but two tracks by a quartet led by pianist Buddy Cole, a wonderful musician who played with Crosby often. This set of 19 Broadway tunes swings beautifully, and hearing Bing with such a simple backdrop highlights his skills as a jazz singer. Compare his version here of "Mandy" with the better known version in the film White Christmas. Crosby lays behind the beat at points, just ahead at others, but he swings effortlessly. His mastery of these tunes by the Gershwins, Rodgers and Hart, Cole Porter, and others is consummate, and his versions sit comfortably beside those of Sinatra and Ella Fitzgerald. John Scott Trotter and His Orchestra give Crosby enjoyable support on two tracks, but it's Buddy Cole's quartet that lets Crosby relax and cut loose on most of the disc. Cole Porter's "It's All Right with Me" has a relaxed chamber jazz feel, while "Get Me to the Church on Time" has a batty, brassy ring to it. "My Heart Stood Still" features a gentle accompaniment from Cole, while "Ain't Misbehavin'" gives the quartet and Crosby free, playful rein. Crosby gives Cole and guitarist Vince Terri a few solo spots, which they use to good effect. The recordings on Bing on Broadway have some background hiss, but nothing distracting on what is a highly enjoyable collection. 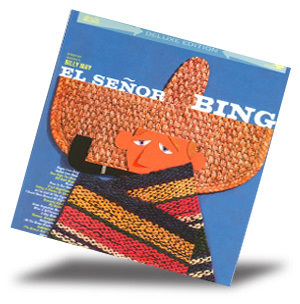 In 1960 Crosby grabbed Billy May to arrange and conduct a batch of tunes with a Latin beat for El Se�or Bing (CCM2108). May had worked with Crosby before, as well as with Sinatra and other singers. Latin music was a May specialty, and he put together ten charts for Bing, most of them interpretations of popular songs. "In the Still of the Night / I Could Have Danced All Night" is typical, with its brassy opening and rattling Latin percussion. Crosby croons in a relaxed mood, and while he doesn�t sound like, say, Dezi Arnez, his joy in singing with the Latin accompaniment is infectious and the arrangements themselves are great fun. All ten of the original tracks are medleys, combining "How High the Moon" and "Old Devil Moon," for example (a high point on the set), or "Pagan Love Song" and "Cuban Love Song." Those tracks, released in stereo, are augmented here with recently discovered, very energetic mono mixes that focus Bing's voice and integrate the percussion more naturally behind him. Cole's quartet backs Crosby for six more bonus tracks, recorded in 1954 to '55 for CBS Radio and arranged in Latin style. "Papa Loves Mambo" had been a hit for Perry Como, and Bing at times seems to be attempting an impression of the younger singer. Drummer Nick Fatool handles the percussion chores convincingly, and as with Bing on Broadway, one of the pleasures of these six tracks is hearing Cole's versatile small group. Crosby had great affection for music from Latin America, and it comes through on this collection. 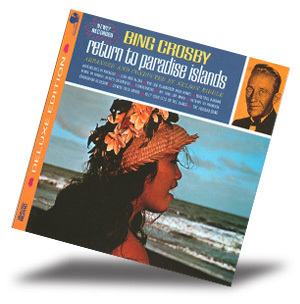 Nelson Riddle arranged for Crosby only once, in 1963 for Return to Paradise Islands (CCM2105), which Bing released on Reprise. The set of songs was chosen for its Polynesian theme, some perhaps more for their evocative titles rather than their South Pacific heritage. "The Hukilau Song," "Lovely Hula Hands," and a couple of other tunes are full-on Hawaiian hokum, salvaged by Riddle's subtle backdrop and Bing's voice. Crosby sounds terrific throughout, his voice strong and steady at age 60. His ballad style was clearly an influence on Sinatra's, and Riddle knows how to accent and highlight the older singer's strengths. Return to Paradise Islands is a very nicely recorded and mastered title, enjoyable if not essential to anyone but completists. One month before Crosby died at 74 on a golf course in Spain, he went into a London recording studio with the Pete Moore Orchestra to record Seasons (CCM2104). Age had taken some of the smoothness from Bing's high notes, but that only adds to the charm of these 12 tracks, to which the reissue producers have added 13. The arrangements have a 1970s flair, which occasionally dates them, but the disc has some moving passages, such as Crosby's reading of "Summer Wind." Seasons is a summing up, a statement of life�s passage as it closes. Crosby recorded eight of the bonus tracks for the BBC on October 11, 1977, just three days before he died. He sounds spry and happy to be singing. On the five remaining tracks, Crosby reads poems by Kipling, Longfellow, and Wordsworth to musical accompaniment, and the result is warm and charming. 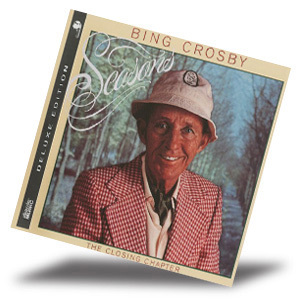 The Bing Crosby discs in this reissue series (it also includes On the Sentimental Side and Bing Sings the Great American Songbook) are elegantly packaged and include informative liner notes. The mastering is very good throughout, and the recording quality, particularly on El Se�or Bing and Return to Paradise Islands is excellent. Crosby made a vital contribution to American music, and these discs are a good place to discover and enjoy his gifts.